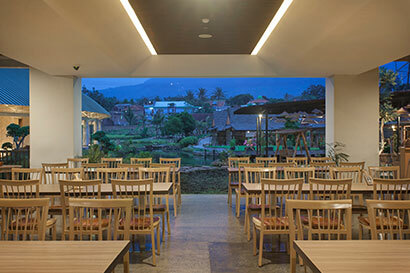 A minimalist modern design of the cozy restaurant is the best spot to spend with your family, friends, or colleagues. 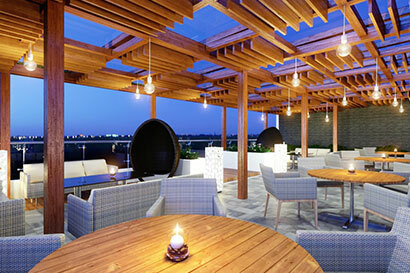 Located in the fourth floor, enjoy the beauty of city skyline accompanied with delectable snacks and fancy drinks. Make your moment more colorful by gathering in Agra Lounge. The unique design and iconic decorative element on the ceiling of restaurant is provided while enjoying sumptuous culinary experience with a wide selection of signature dishes such as Gurami Terbang & Nasi Bakar Kendil. Kids playground is also set up surrounding the restaurant area, catering to guests with children.